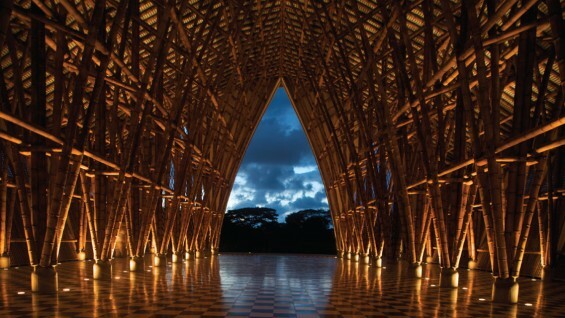 Simón Vélez is a prize-winning architect from Columbia, acknowledged as a pioneer in the modern use of bamboo as an essential building component. Mr. Vélez’s major achievements of establishing bamboo as a desirable material for all social and programmatic levels of Architectural work, comes out of close collaborations and relationships on site. Much of his work has been in very rural areas, where due to a lack of a regulating authority and the relative difficulty of importing the standard building materials of brick and mortar, he found an opportunity to experiment with the locally available materials. With Marcelo Villegas, he developed a mortar-filled joinery system that allows long span and cantilevered structures to be built out of bamboo. By building only with his own well-trained crew of workers, he is able to constantly draw upon past successes and failures in detailing. He intentionally keeps drawings simple, usually freehand on single sheets of 8x11 graph paper. A bamboo pavilion for the Expo Hanover 2000, the Zócalo Nomadic Museum in Mexico City, which houses Gregory Colbert's "Ashes and Snow", and a bridge for Crosswaters Ecolodge, the largest commercial project in the world to use bamboo. The project received the American Society of Landscape Architects 2006 Analysis and Planning Award of Honor. In December 2009 he received The Principal Prince Claus Award for his contribution to a positive interaction between culture and development. Simón Vélez graduated from the University of Colombia in Bogotá, where he lives and has practiced architecture for more than 40 years. The lecture was in collaboration with the Architecture League of New York. Click here to read an interview with Simón Vélez conducted following his Current Work lecture.